SERENO RECEIVES BOOS AFTER SAYING DE CASTRO SAID "I will never forgive you for accepting the chief justiceship"
Chief Justice Maria Lourdes Sereno disclosed that Associate Justice Teresita de Castro came to her on her first day in office and said "I will never forgive you for accepting the chief justiceship." Her speech during Araw ng Kagitingan as awardee, further disposed that she was asked by De Castro that she should not applied in the first place. 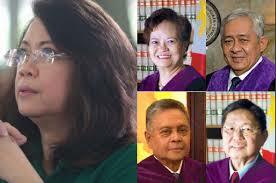 Sereno included De Castro in her petition for refusal from participating in the quo warranto proceedings in the Supreme Court and four other SC justices, like De Castro as witnesses in Gadon's motion to remove Sereno as Chief Justice.